Acoustic ultrasonic safe "SPY-box Casket-1 Smart"
The acoustic ultrasonic safe "SPY-box Casket-1 Smart" is designed to protect against unauthorized remote connection to the smartphone and against the activation of the microphone for listening to voice information during important negotiations. Intelligent mode automatically switches the ultrasonic radiation and an acoustic speech chorus on that completely muffle microphones on smartphones, making it impossible to understand human speech when listening to or remotely recording audio. The wiretapping blocker is turned on and off with the remote radio key fob, which allows you to activate the protection mode unnoticed to the interlocutors. The structural feature of the acoustic safe in the form of a book or a casket allows you to simultaneously protect up to six smartphones from wiretapping by just putting them inside the device. The device can operate autonomously using the battery in protection mode for up to 60 minutes or permanently from the 220 volt network through the adapter. The acoustic ultrasonic safe "SPY-box Casket-1 Smart" can be used during business negotiations and meetings. It's enough to put smartphones inside the safe and turn on the blocking of the wiretap. If the meeting is planned in an informal setting, then an acoustic safe can be taken with you, because the built-in battery can ensure uninterrupted operation of the ultrasonic block for 1 hour. Intelligent switching system. The acoustic safe is equipped with a built-in radio magnetic detector, which automatically turns on the acoustic and ultrasonic interference of the microphone, thereby blocking the transmission of voice information upon detection of a radio-frequency disturbance when connected to a smartphone. Ultrasonic protection from wiretapping. There are 12 ultrasonic radiators inside the box, which, when activated, directly affect the microphone of the smartphone, creating a vibration on it, which makes listening to human speech and understanding the essence of the conversation impossible. Acoustic impact on audio recording. The device creates a noise background in the form of a multi-voiced speech chorus, which, if you listen to or record the conversation through the microphone of your smartphone, will not allow understanding any voice information. Remote control. Wireless radio remote control allows you to turn the acoustic safe on / off from the distance of up to 10 meters unnoticed to third parties. Autonomous work. The acoustic safe is equipped with a built-in battery, which allows using it with no 220 volt network connection. 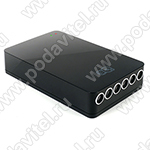 When using two modes simultaneously, the device can work autonomously for up to 1 hour. In standby mode, the battery holds a charge for up to 168 hours. Continuous work. For round-the-clock protection of the smartphone from wiretapping, the device may be connected to the 220 volt network through the adapter. 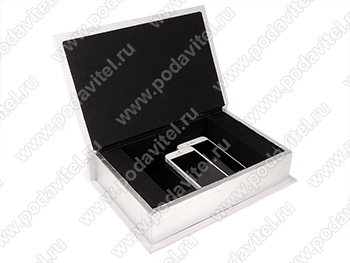 «SPY-box Casket-1 Smart» - 1 pc.